What is Hosted Email Security? Hosted email security is most often a cloud-based email filtering service provided by an established online security company. The reason why many businesses choose to use hosted email security software is to take advantage of its advanced features in order to increase spam detection rates and limit the number of phishing emails entering the network, as well as those harboring malware and ransomware. Cloud-based email filtering services are low maintenance solutions, with software updates being performed by the company providing the service. They also have the advantages of being universally compatible with every operating system, infinitely scalable and cost-effective – requiring no hardware purchases or software installations, and being supported by the service provider´s technical team. To better protect their networks against spam email, businesses create an account with a service provider, add their domain and a domain administrator, and then connect to the service provider´s servers by redirecting their MX records. Thereafter, all incoming emails pass through the service provider´s servers, and are filtered according to policies created by the domain administrator. User policies can be imported from existing directory tools or created and amended as required. Domain administrators can apply different acceptable spam thresholds by user, group, domain or business-wide via a centralized management portal (a default threshold is applied until this is done), and schedule reports to be sent to each user when mail is quarantined by the hosted email security software. Thereafter, domain administrators can easily monitor the volumes of spam emails being detected, tagged, quarantined and rejected in real time via the management portal or historically via a suite of customizable reports. These reports can help business with reviewing their online security and compiling risk assessments if the business operates within a regulated industry. Not all hosted email security software is the same. Although most use Real Time Blacklists and SURBL filters to block emails from known sources of spam, those with higher spam detection rates use a process known as greylisting to help identify emails from previously unknown sources of spam. Greylisting can delay the delivery of emails to users, but the benefits can be substantial. Research has shown the average spam detection rate for the top ten email filtering services without greylisting is 96.86%. Even with this high spam detection rate, an office-based employee will receive an average of twelve spam emails per day. By comparison, hosted email security software with greylisting detects 99% of spam email – reducing the number of spam emails received to a daily average of four. The time spent by a single office-based employee identifying and deleting eight spam emails per day may not be very long. But, multiply that time by thousands of employees, and over the course of a year a business can save tens of thousands of dollars in lost productivity as well as reduce the number of potential threats entering the mail network by 67% – usually for no additional cost. SpamTitan has been producing online security products since 1999. In nearly two decades, thousands of businesses across the world have used our services to mitigate web-borne and email-borne threats, and enhance productivity in the workplace. Our hosted email security software has achieved spam detection rates of 99.97% in numerous tests with no or minimal false positives. SpamTitan´s hosted email security software includes greylisting among a number of front-end tests to maximize spam detection. Our software scans both inbound and outbound mail for malware in order to provide an extra layer of security and prevent the potential IP blacklisting. Multiple web authentication settings and recipient verification types provide domain administrators with flexibility over how they wish to apply the software´s parameters, plus SpamTitan is available in a choice of deployment options. In addition to providing a cloud-hosted service, SpamTitan offers business´s a Gateway on-premises email filtering service that can be installed seamlessly into a physical or virtual infrastructure. We also offer a cluster option, and the possibility for SpamTitan´s hosted email security software to be hosted in a private cloud – an ideal solution for Managed Service Providers. To find out more, contact our team of Sales Technicians today. 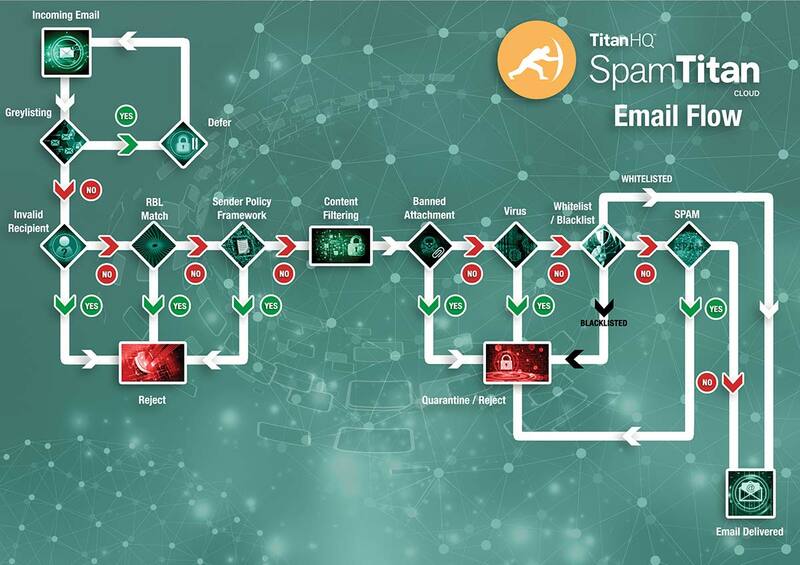 Our team will be happy to answer any questions you have, help determine which format of hosted email security would be best for your specific circumstances and invite you to take a free trial of SpamTitan so you can evaluate the merits of our hosted email security software in your own environment.